Had it not been for the Industrial revolution and the gulf between capitalists and workers, the Communist Manifesto might never have been written, nor made the impact it had. Marx sees the history of the world divided into the oppressors and the Oppressed. Marx sees this gulf as being about the same as lord and serf, prince and peasant, emperor and slave. "The modern bourgeois society that has sprouted from the ruins of feudal society has not done away with class antagonisms"
Even given the historical class differences, Marx feels very strongly that "the epoch of the bourgeoisie…has simplified…class antagonisms. While in history, the difference between the Haves and the Have-nots was land, or a royal title, or influence in Court, now Marx sees the ills of Industrialism as money: "callous cash payments". He even sees professions, like the law, medicine, science, the arts and the Church turned into "paid wage laborers". It seems interesting and unusual that Marx combines professionals and Churchmen into the so-called "working class", controlled by the wealthy land- and factory owners, whose money comes from investments, not labor and that they have the means to pay for services rendered without really having worked for that money. In other words, the bourgeoisie has become what later sociologists will cal "The Leisure Class". Today, in the U.S. we often hear about a very small percentage of the wealthy owning a very large percentage of manufacturing and the media. Marx has the same thoughts. He states that the bourgeoisie has "concentrated property in a few hands. He blames the bourgeoisie for bringing more and more rural populations to cities which grow larger and larger, and more and more unwieldy. Marx also accuses the bourgeoisie of foster unemployment. He says that this is because of the creation of more and more productive machines which replace workers. This, of course, is good for the capitalist, and bad for the worker who, as Marx puts it, "make the wages of the workers ever more fluctuating". This industrialization causes not only unemployment, but competition for the remaining jobs. It is this combination of labor's ills which has forced the workers to create unions to present a stronger force to meet the demands of the bourgeoisie. Because of relatively low wages and job competition, the working class is unable to buy property. Marx, therefore, feels that the only solution (the Communist ideal, but not initiated by the Communists) is to abolish property; "Not the abolition of property generally, but the abolition of bourgeois property". The bourgeois property is seen by Marx as the real cancer of his day. It is "the exploitation of the many by the few". He sees this exploitation as a sort of vanishing point of the individual. He threatens the bourgeoisie for being responsible for the workers losing their independence and their individuality. Marx's indictment of the bourgeoisie goes well beyond chastising them for exploiting workers and earning their money without a bit of sweat on their bodies. He attacks bourgeois families and even education. He promises to "rescue education from the influence of the ruling class". He also is concerned about "the bourgeois claptrap about the family and education (and that) the bourgeois sees in his wife a mere instrument of production". In other words, while the working class children forego a complete education and are forced to go to work early, the bourgeois is able to send his children to schools and universities so they can replace their fathers in running factories and supervising production. However, Marx also creates some 10 ideas that would more or less equalize the classes. He may be the first in history to recommend "a heavy progressive or graduated income tax…Abolition of all rights of inheritance. Centralization of credit in the hands of the state by means of a national bank (and) free education for all children in public schools; Abolition of child factory labor…". At first glance, many of Marx's ideas are not only logical but do-able and even worthwhile. Certainly free education is something that every country in the world now either offers or, at least, promises. 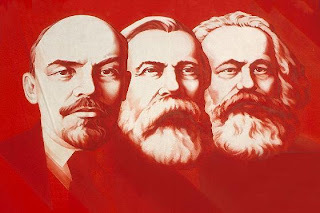 The question remains that, given these rather positive suggestions to create some additional benefits and stimulus for the working class, what has really spurned all this hatred toward Marx, Marxism, and Communism? The assault on Marxism is, in retrospect, not merely political but psychological and sociological. Why? Since Cain and Abel, Jacob and Esau in Biblical literature, there has always been a sharp dividing line between activists and those who merely benefit from those actions. In Europe, as Marx clearly sensed, the French declaration of the Rights of Man ended up not as a democratic form of government as in the U.S., but in a Napoleonic era of world conquest and eventual defeat. The same workers who revolted at the Bastille were the ones who fell in the snows of Russia. In World War I the term "cannon fodder" became popular in usage about the working class soldiers who were sent to be slaughtered in No Nan's Land. The officers were patrician, the privates and corporals were Iowa farm boys. The British officers came from Oxford and Cambridge and Eton. Their troops came from Welsh coal mines and Liverpool docks. Marx was not only exploiting the idea that life was unfair, but that class differences were unfair and unreasonably stacked against the working class. Perhaps the hatred of the bourgeoisie and the highly educated for Marx is that they felt that he was betraying them. Rank had its privileges. So did higher education, which was basically limited to the wealthy, the Capitalist class that Marx railed against. Marx's idea about not inheriting is quite reasonable: why should someone's accumulation of wealth be handed to the next generation who has done nothing to earn it. The very basic idea of Communism (which cannot thrive in a large society) is that one earns according to what one contributes to society. Perhaps Joan Kroc (widow of the founder of McDonald's) had it right, when her will gave tens of millions to National Public Radio, instead of some grasping surviving relative. Marx, feeling that the time is right, therefore urges the workers of the world to unite, citing that it has been tried in the past and been unsuccessful because the laboring or under-class was not prepared to overthrow the ruling classes. In reading this Communist Manifesto, one can see it is not just an angry, frustrated diatribe. Marx makes some valid recommendations. But, despite his seeming hatred of the ruling class and its exploitation of workers, there is one big illogical conclusion. While he may seek the equal distribution of property, even the use of waste lands for public parks, the one thing he does NOT address (and perhaps the one thing that destroyed the lives of so many in what was called "Communist Russia" after the 1917 Revolution, is the fact that unless someone or a group of someones are in charge, there would be a power vacuum. Someone has to make decisions. Someone has to control the various factions and unions. Communism certainly is not a democratic or republican form of governing. It is best summed up by George Orwell in Animal Farm, where the pig announces that some are created more equal than others. In other words, what happens AFTER a workers' revolution? And, unlike Russia, what happens to the bourgeoisie? One cannot read Marx's works, or that of any philosopher in the last few centuries without wondering why philosophers come from wealth, or develop the means to support their ideas. It may not have been until such American "philosophers" of the working class like Eric Hoffer (maybe now Studs Terkel's interviews) that we have lower class philosophers whose ideas and words are circulated, read, discussed, and to some degree even heeded. If there is one lesson to be learned from the Communist Manifesto, other than arguing about its political or economic worth (or lack thereof) it is the fact that philosophy and philosophers must come down from their pedestals of upper and upper middle class presumptuousness. In other words, what is the value to those of us who have no silver spoons in our mouths, to read about aristocratic idealism. It was enough to titillate the upper classes with Descartes' "I think therefore, I am!" Today, we need philosophers whop believe "I work. Therefore I survive".